Last week when Amma had got these corn kernels, we wanted to cook as many dishes with these as we could. But as it would be, we couldn't find enough time to get whatever we planned. Then when hubby dear went on a day's trip we had lunch to be planned only for us. This actually gave us some new possibilites as Athamma wanted me to make something with these corns and complete it. 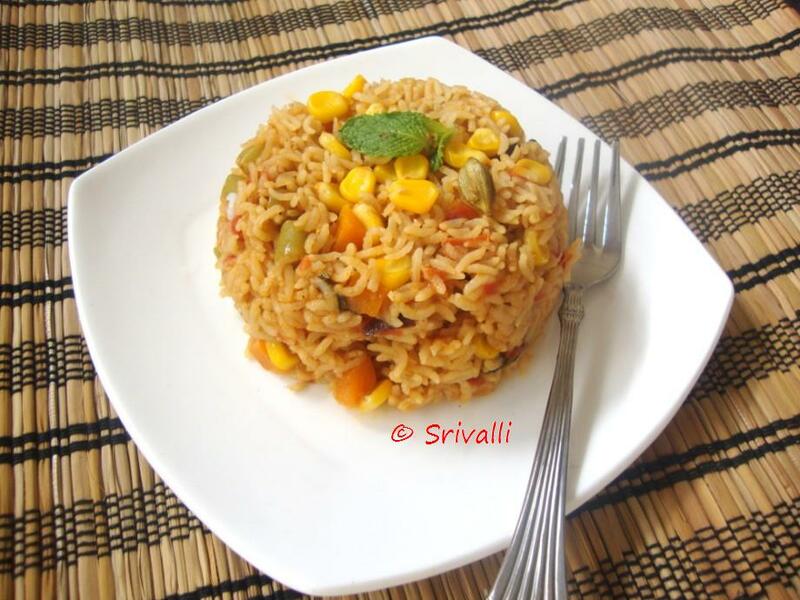 I made this Corn Vegetable Pulao, which was very quick and easy to make. Everybody at office loved it and came back home to know that kids liked it too and wanted it to be done again. They ate their lunch without complains and I had a dish that surely meets their liking. I just went about doing it as the regular pulao, just making sure that rice doesn't get overcooked and the corns are intact. Green Chilies - 3 medium. Mint leaves - 4-5 leaves. Wash and soak rice for 15 mins. Heat the pressure pan with oil. Add the whole spices and stir for couple of minutes. Then add onion julienne, slit green chilies, stir till the onions are light brown. Then add the ginger garlic paste. Cook for couple of minutes. Then add finely chopped tomatoes, add the chili powder, salt and simmer for few minutes til the tomatoes are soft. 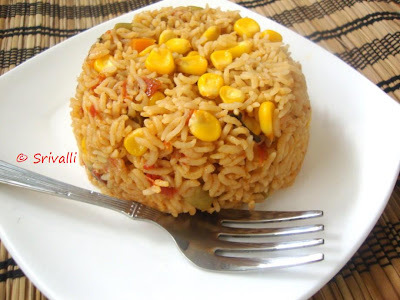 Add the chopped vegetables along with corn kernels. Combine everything well. Add the mint leaves, drain the rice and add to the pan. Saute for couple of minutes. Then add 3 & 1/2 cups of water. Bring to boil and cover to cook for 3 whistles or till done. I took this for my lunch and my colleagues liked it so much. More than that, I was elated when my boys loved this and wanted this to be made again. Reduce the spice if kids don't eat more spicy but as such this wasn't so spicy. What do you pack for your kids?